Huawei Nova 3 Officially Confirms July 18 Launch Date - Playfuldroid! During a recent press event, Huawei had confirmed that it will be debuting the Nova 3 smartphone on July 18. 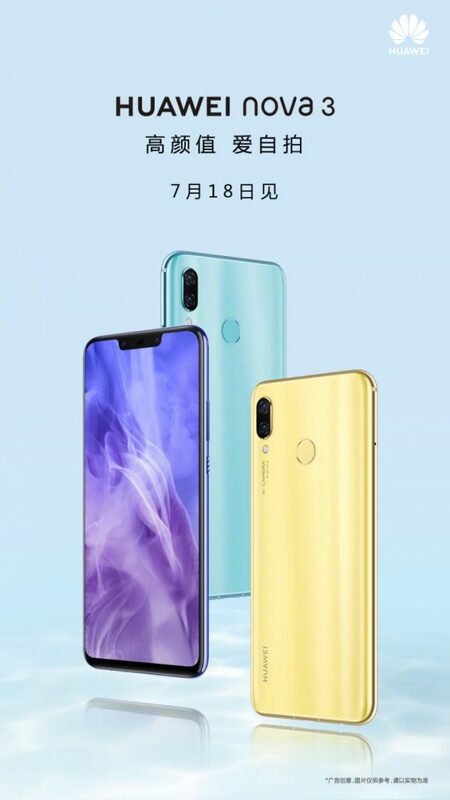 Today, the Chinese manufacturer has officially confirmed on Weibo that the Nova 3 will be indeed announced on the said date. Earlier this year, the Huawei P20 Lite smartphone was released as Nova 3e in Europe and now the company is prepping up to launch the Nov 3 smartphone in China. Recent teasers have revealed that it will be arriving in colors like gold, light blue and Aurora. It sports the same notched display design that Huawei had used on the P20 series. The backside of the phone that is made out of glass has a fingerprint reader and a vertical dual camera setup. What’s interesting about Nova 3, it is the first phone to feature dual cameras at the front and rear. The rear features 16-megapixel + 24-megapixel dual camera setup whereas the front one has a 24-megapixel primary sensor and a 2-megapixel secondary sensor. The smartphone is expected to house a 6.3-inch IPS LCD display, 6 GB of RAM, 64 GB and 128 GB storage choices and 3,650mAh battery. It will come loaded with Android 8.1 Oreo skinned with the latest EMUI skin. It is speculated that the company will be using the July 18 launch date to announce the rumored TalkBand B5 smartband that comes with an in-ear Bluetooth headset. It is arriving as a successor of TalkBand B3 that was launched in 2016. One of the major improvements on the B5 is that it comes with a larger color display.